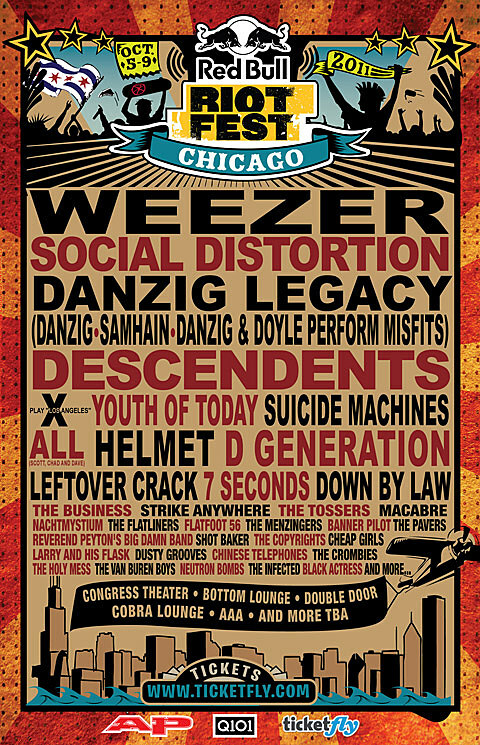 As previously announced, Red Bull’s Riot Fest Chicago is set to take place at various venues throughout the city from October 5th – 9th. On Friday October 7, 2011 Danzig(!) will headline Riot Fest and perform a career spanning show featuring sets of Danzig, Samhain and Misfits songs with none other than Doyle joining on guitar the Misfits set. We’ve waited years for this and we can’t wait to see the inside of the Congress Theater turn into a churning sea of humanity. Tickets are on sale now, with more band announcements are stil to come(! ).